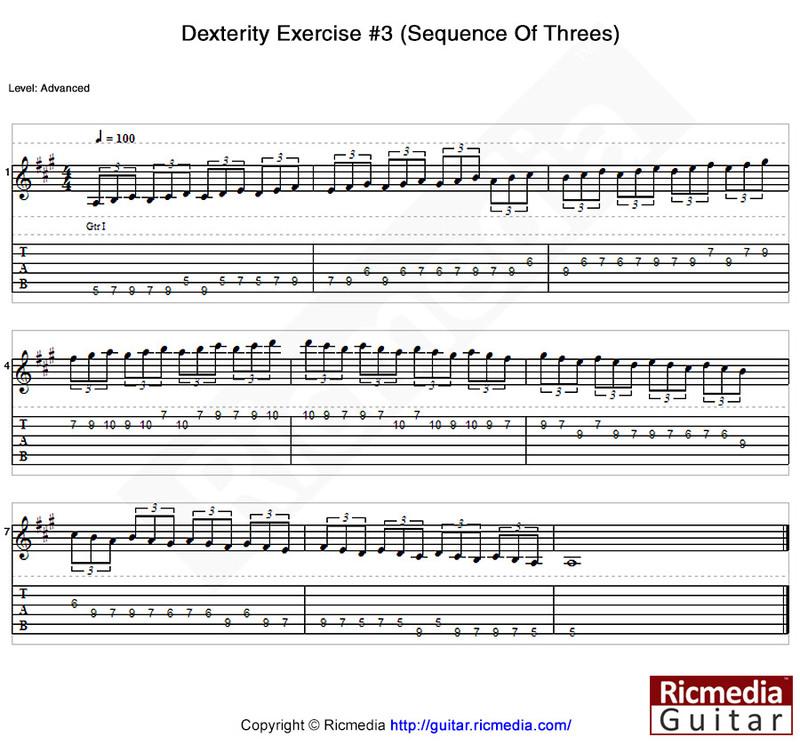 In this lesson we will explore three different dexterity exercises that will help you build hand/eye coordination, strength, and also aid your alternate picking and should be included in your regular warm-up and/or practice routine. Perhaps do some hand stretching for a few minutes before you begin the lesson. 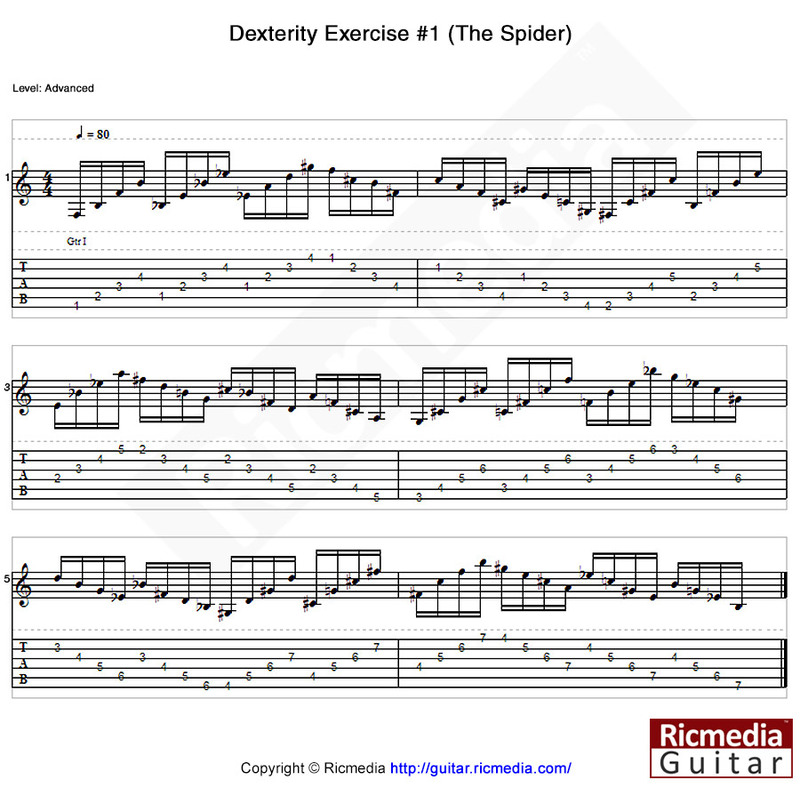 The first dexterity exercise we will learn today is called The Spider (a nickname I gave it due to the spider like pattern) and is a doozee for alternate picking and string skipping. 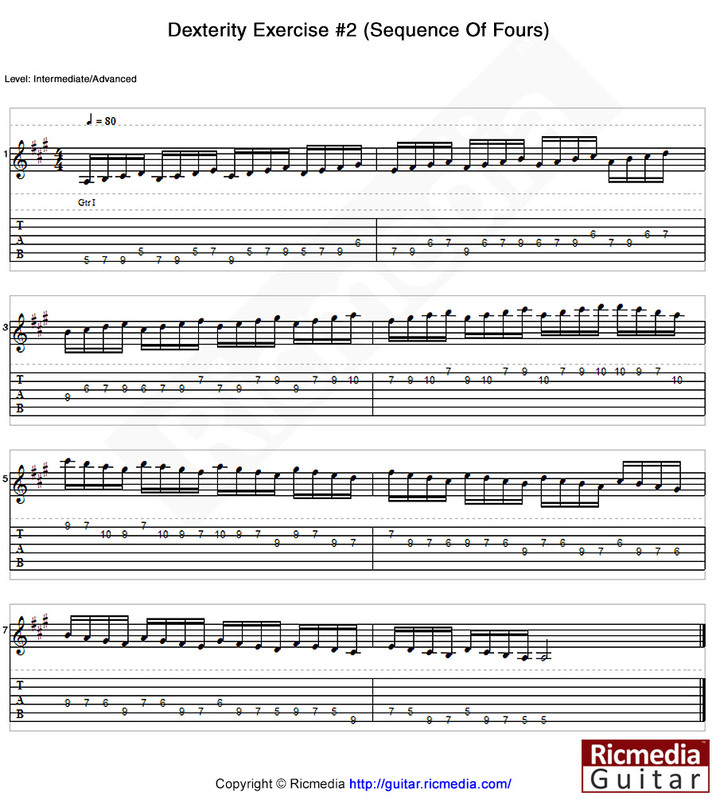 First, take a look at the tablature below and listen to the audio sample underneath the tablature. We start off on the sixth string, first fret, then the fifth string second fret, then fourth string third fret, and finish off this section on the third string fourth fret. This is the same pattern we use for the next section however, this time we start on the fifth string, and then start the pattern again on the fourth string. At this point, we reverse the pattern and start on the first string first fret, then the second string second fret, then the third string third fret, and finally on the fourth string fourth fret. Again this is the same pattern we use for the next section however, this time we will start on the second string second fret, then repeat the pattern again starting on the third string first fret. This concludes the entire pattern and from this point, we simply repeat it except starting on the sixth string, second fret (moving the entire pattern up one fret). Before you start practicing this exercise using a metronome, make sure you put the whole pattern to memory first, then start off at about 50bpm to 60bpm and only step up the speed when you are playing clear with no mistakes. Now onto the next part of this lesson which is a sequence of four using major scale pattern #5, a nice three note per string scale pattern that lends itself nicely to these kinds of sequences (have a listen to the audio sample below). Starting off on the sixth string fifth fret, we play the next three notes of this scale pattern which are the six string seventh fret, then ninth fret, then onto the fifth string fifth fret. At this point, we backtrack three notes to the sixth string seventh fret, and play another three notes up which are the sixth string ninth fret, fifth string fifth fret, then fifth string seventh fret. So as you can see we are basically playing the first four notes of the scale, then we play another four notes except this time we start on the second note of the scale, hence the name sequence of fours. This pattern continues up to the tenth fret at which point we simply reverse the pattern and start descending the scale. Once again, before you start practicing this exercise with a metronome, make sure you put it to memory first, then start off at about 70bpm to 80bpm and only step up the speed when you are playing clear with no mistakes. Onto the last part of this lesson which is identical to exercise #2 except it’s a sequence of three instead of four, and is played in triplet fashion rather than sixteenth notes. Starting off on the sixth string fifth fret, we play the next two notes of the scale pattern, and then backtrack to the second note of the scale and play another two notes up, then backtrack again to the third note of the scale and play another two notes up. This pattern simply repeats itself until you reach the first string tenth fret, at which point the whole pattern is reversed and you begin descending the scale. And again, before you start practicing this exercise with a metronome, make sure you put it to memory first, then start off at about 70bpm to 80bpm and only step up the speed when you are playing clear with no mistakes. Well this brings to an end another lesson, and I hope you enjoyed it. These exercises can be quite tricky but I guess that's the whole point of the lesson, to get you out of your comfort zone!